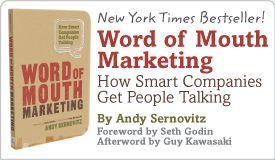 Never underestimate the cost of negative word of mouth | Andy Sernovitz | Damn, I Wish I'd Thought of That! Angry, frustrated customers talk. A lot. Pete Blackshaw’s book title said it well: Satisfied Customers Tell Three Friends, Angry Customers Tell 3,000. Too often, otherwise well-meaning organizations forget how expensive negative word of mouth is. Corners get cut, standards get lowered, and quality slips. And as soon as customers notice and start talking, it takes 10 times the effort and resources to turn it around than it would to just do it right the first time. One of Zappos’ core missions is to deliver “WOW” through service. They’re able to do it because they have an amazing staff — and they understand the cost of negative word of mouth. At the end of their intense training program, Zappos offers new trainees a $2,000 bonus to quit. It seems like a lot, until you consider how expensive poor customer experiences are for Zappos — a brand built on creating love and happiness. It’s a fantastic final test. The people who are there to deliver wow experiences stay, and the ones who were going to cost Zappos 10 times that in poor customer service move on.